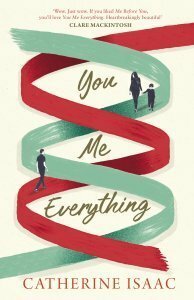 Very excited today to be on the blog tour for Catherine Isaac and her stunning novel You Me Everything, a book that I totally adored. As mom to a son, I loved Jess’s relationship with her son Will, and I think I felt every single emotion of Jess’s as I read this book – it was such a rollercoaster read. I wanted to dislike Adam, but I didn’t. I was annoyed with him in parts, but I was routing for him to do the right thing. This book certainly raised my awareness of Huntington’s disease and got me thinking about how I would feel in certain circumstances. My heart felt a little battered and bruised at the end of this book, but in a good way. It was a book that stayed with me for a long time after I’d read it. And France is a place, I’ve only ever been to once, but I want to go to this exact place that Adam managed. The descriptions made it totally come alive for me, and I’d be extremely happy to spend a summer holiday there. Gorgeous! You Me Everything is one of those beautifully written, life-affirming, feel-good, inspiring reads that make you want to make the most of every day of your life and love those close to you. It’s a book about giving people chances and that not everything is as it seems. Big thanks to Catherine who has agreed to answer some questions for my little old blog. Hope you enjoy our chat. Can you sum up You Me Everything in one sentence? A love story in the widest definition of the term, set during one glorious summer in the Dordogne, France. Who do you get your writing inspiration from? On occasions, something that happens in real life will spark an idea. For example I came up with the storyline for You Me Everything after I learnt that a friend’s mother had Huntington’s disease and was struck by the ripple effect of that diagnosis. Like all authors, though, I’ve simply got a well-developed sense of imagination. I’ve had this all my life, but inspiration – or at least whatever it is that encourages me to write – can come from all manner of sources: running, listening to music, reading. I have a modest-sized office (slightly poky if I’m honest; I aspire to an upgrade! ), but it’s got a lovely big window that makes it nice and bright. I lovingly decorated it myself with some pretty wallpaper and old travel posters of Italy. I’ve also got a set of shelves that feature all the novels I wrote under the name Jane Costello… which is now filling up nicely with foreign editions of You Me Everything by Catherine Isaac! France plays a big part in the book, is it a place that holds special memories for you? Yes, France was where I spent my first foreign holidays as a child and my family loved it so much that we returned year after year. The locations in You Me Everything – everywhere from Sarlat to Domme – are places that are ingrained in my memory. Having the opportunity to vividly recreate all those beautiful sights, sounds and tastes when I wrote the book was a real joy. What made you go with a different name? Mainly because You Me Everything is so different from the romantic comedies I wrote as Jane Costello. It has more emotional depth and deals with a difficult subject matter; quite simply, it’s a ‘bigger’ book. As such, it wouldn’t have felt right to publish it alongside the likes of The Time Of Our Lives, or Bridesmaids. Also, as soon as my agent Sheila Crowley read it she had big ambitions; the suggestion to change my name was hers. Writing as Catherine Isaac has brought with it the kind of opportunities that never came my way previously, such as being published in the USA and optioned for a movie by Lionsgate and Temple Hill. How are you finding two different writing names? Does it mean twice the work? Twice the social media profiles etc? Not quite twice the work as I’m predominantly Tweeting and Instagramming as Catherine Isaac now. Though, oddly, I seem to have lots of new followers for my Jane Costello account lately, despite my efforts to tell them they won’t find much going on there these days! Will you continue to write as Jane Costello too? Or is Jane having a rest? Jane these days spends most of her time reclining under a palm tree in the Caribbean, where she’s finally catching up with her TBR pile…. If only! In fact, there are no plans to write as Jane Costello just at the moment, simply because the new direction of my career as Catherine Isaac has been so fulfilling. So it’s those, more ambitious novels, where my current plans lie. What tips do you have for any aspiring writers? Catherine Isaac was born in 1974 in Liverpool, England. She studied History at the University of Liverpool, before completing a postgraduate diploma in Journalism at Glasgow Caledonian University. She began her career as graduate trainee at the Liverpool Echo. At 27, she was appointed Editor of the Liverpool Daily Post and held the position for five years. She wrote her first book, Bridesmaids, while on maternity leave and under the pseudonym Jane Costello. 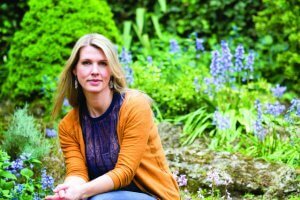 She has since written nine books, all Sunday Times bestsellers in the UK. You, Me, Everything is her first novel writing as Catherine Isaac. She lives in Liverpool with her husband Mark and three sons. In her spare time she likes to run, walk up mountains in the Lake District and win at pub quizzes, though the latter rarely happens. Film rights to this novel have been optioned by Lionsgate, and foreign rights have sold around the world.